On behalf of Mr. Mikhail Gorbachev and my colleagues at the Permanent Secretariat, it is with great privilege that I am here today to fully support and announce that the city of Bogotá will be home to the 16th World Summit of Nobel Peace Laureates in February 2017. The World Summit of Nobel Peace Laureates shares nearly two decades of rich history promoting the values of peace, traveling to vibrant and inspiring cities around the world on an annual basis. Each city is carefully considered, and each city brings with it its own historical significance. Please allow me to share a little bit of history that highlights the significance of today’s announcement. Mikhail Gorbachev won the Nobel Peace Prize in 1990. During the 1990s he met his fellow Laureates and realized that all its winners, both individuals and organizations, had messages of extraordinary importance for humanity. He concluded that it would be exciting and valuable to annually unite with his fellow laureates to engage in dialogue about current issues and challenges of the times, with hopes to send messages of inspiration and wisdom to the entire world. So in 1999, the first World Summit of Nobel Peace Laureates was officially launched in Rome, with the enthusiastic participation of more than 25 Nobel Peace Prize Winners, their delegations, and even Pope John Paul II who hosted a session at Vatican City. It was clear that this endeavor was worthy of continuing and growing. Indeed it has and the rest is history. So why Bogotá? As Nobel Peace Laureate His Holiness the Dalai Lama teaches us, it is our common responsibility to promote basic human values, love, compassion, forgiveness, tolerance and dialogue. The Nobel Peace Summit’s mission is exactly that – to promote these values through the inspiring stories of Nobel Peace Prize Winners, as well as civil society leaders, who prove that these values have practical and positive impact when used. As Nobel Peace Laureate Albert Schweitzer used to remind us, each one of can make a difference and make this world a better place. Today we have the privilege to have here with us the Head of the Albert Schweitzer Institute, who il also the coordinator of our Summit’s youth program. The Summit will bring together the minds of all of them to address issues that affect our common wellbeing. 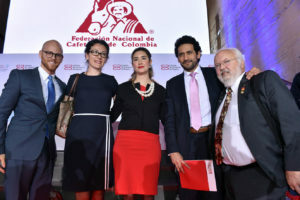 Of particular relevance to the people of Colombia, it will share examples of courage and non-violence that have helped other nations when building democratic paths towards social justice and sustainable peace. 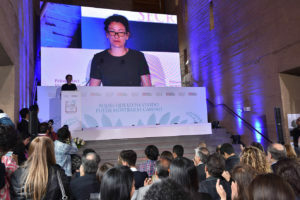 This is why our committee, in partnership with several Nobel Peace Laureates, selected Bogotá as home for the 16thWorld Summit of Nobel Peace Laureates. Indeed, this is the first time the World Summit of Nobel Peace Laureates will be held in Latin America. This is something that each and every one of us should take pride in. We’re sure that each individual in Colombia will benefit from the Summit’s platform for open dialog, and we are also sure that the Summit itself will be enriched by this experience that we will have, together, in your marvelous country. Thank you very much for your attention and see you in February at the Nobel Peace Summit!